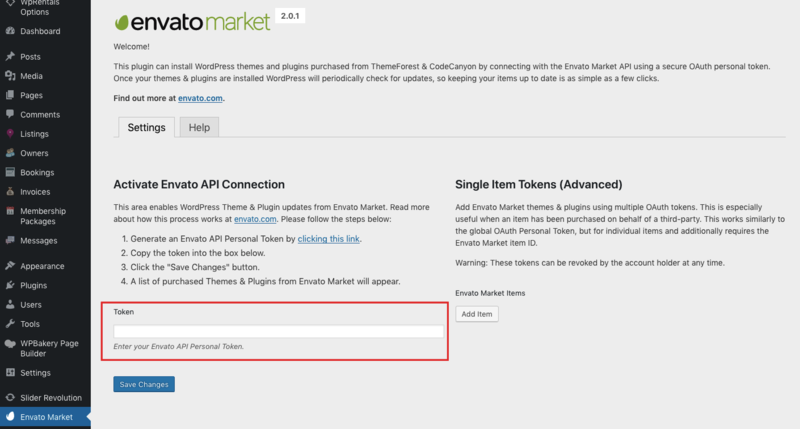 Each new theme update sends a notification to buyers via Theme Forest market. Do a backup the files and the database, in case something goes wrong with the server, use the backup to revert to the previous state. 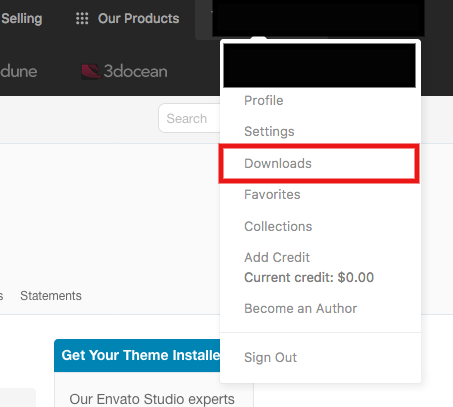 Log in with your Theme Forest buyer account and Download the theme from under the Downloads menu. Go to Install Plugins if you don’t see the message. Login via FTP. 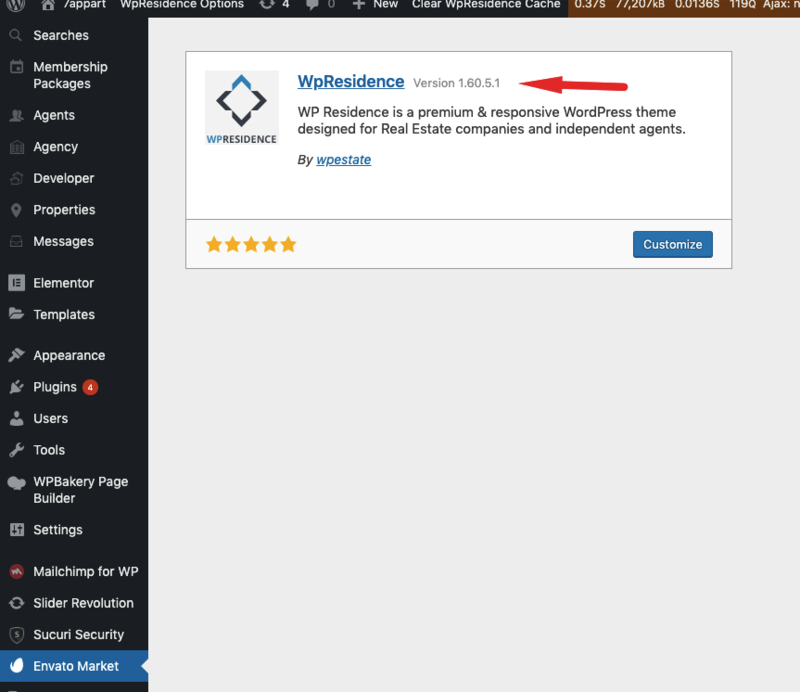 Go to “yoursite/wp-content/themes” folder location and backup your wpresidence theme folder by saving it to your computer, or rename it (wpresidence_old). Your content will not be lost but note that if you have modifications to the theme code they will be lost. You have to reapply them after the update is over. 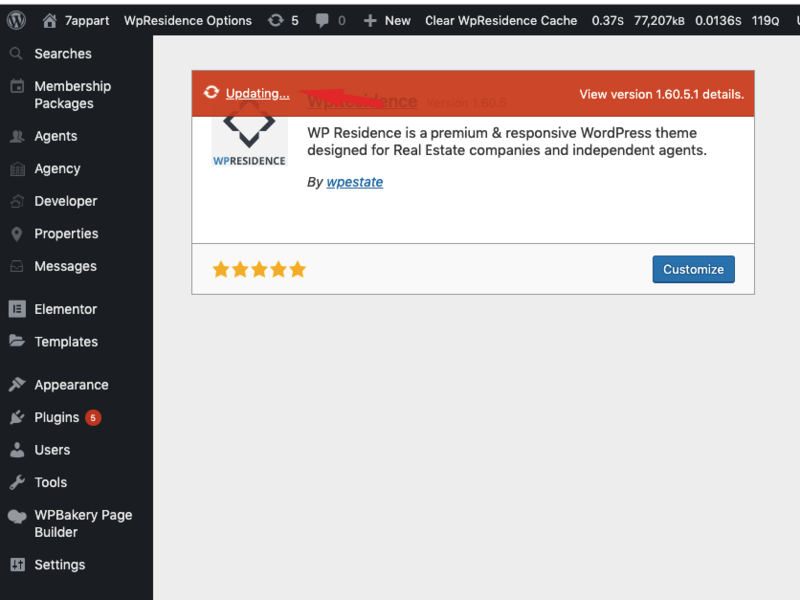 Retrieve the wpresidence.zip file from your recently ThemeForest download and extract the file to get the updated wpresidence theme folder. Or copy directly the wpresidence folder. 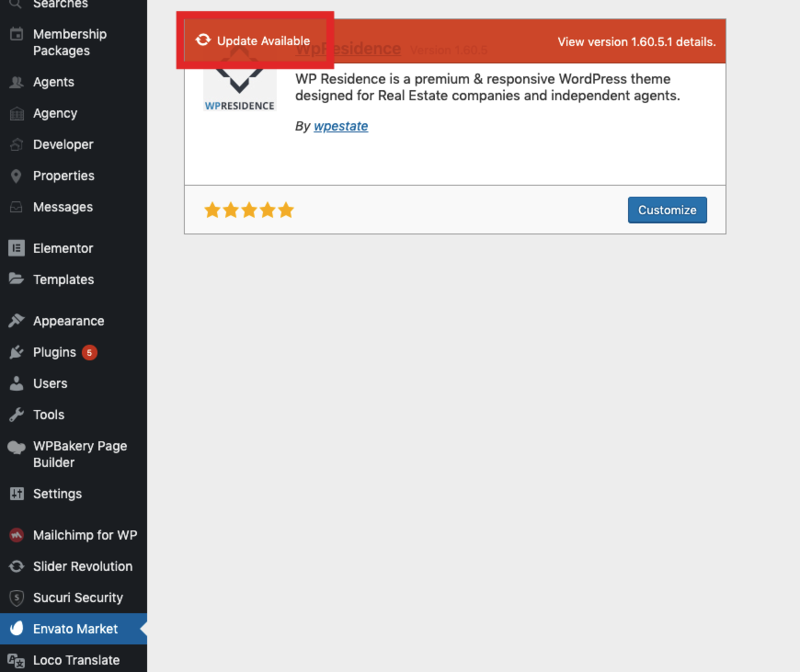 Upload the wpresidence theme folder into “yoursite/wp-content/themes” and overwrite the existing files. NOTE: make sure you don’t copy theme files inside the previous theme folder and get duplicate files. Next – if you had any special modifications done in the previous theme version you can copy from wpresidence_old backup to new wpresidence folder. But we would strongly recommend using a child theme for changes. Once you activate a different theme, delete the wpresidence theme. Don’t worry, your content will not be lost. 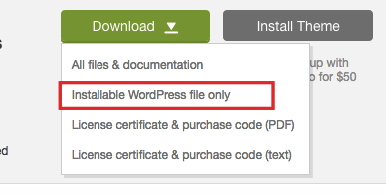 Get the “wpresidence.zip” file from your Theme Forest – Buyer account section (Installable WordPress file only). If you downloaded the “All Files & Documentation” from Themeforest, then you need to unzip the archive file you received, the wpresidence.zip will be inside it. Go to Appearance > Themes, choose Add New Theme, Upload the wpresidence.zip and click on the “Install Now” button. You DON’T need a buyer license to use these plugins. 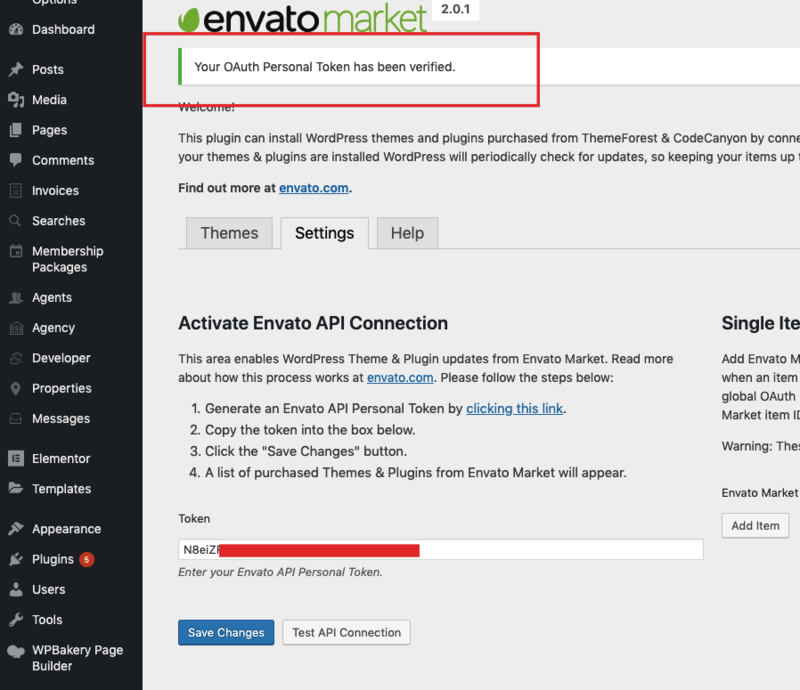 We purchased an extended license we give all our clients plugin updates through theme updates. There is only one license per purchase – so only we can use this license to get the updates and then share the update with our clients.